The way to Finisterre and Muxia begins from the main cathedral in Santiago de Compostela and heads west for approximately 90km. 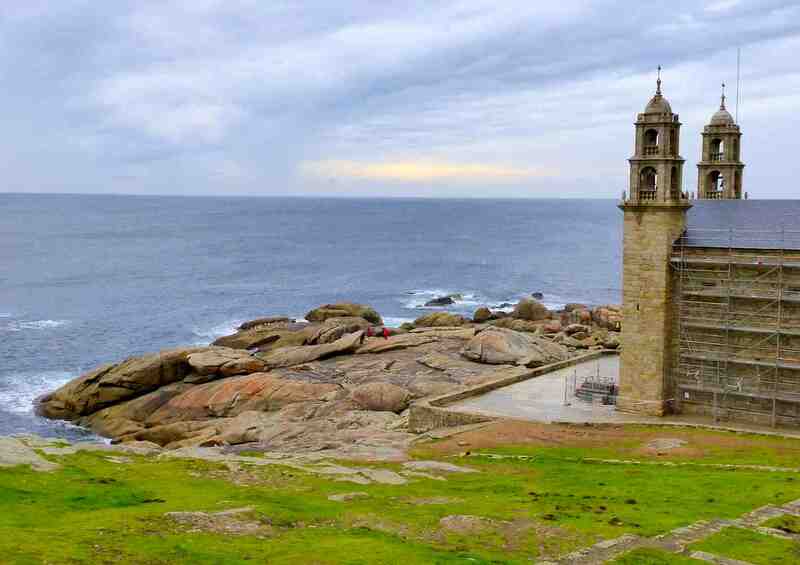 It travels across the peaceful country side of Galicia, all the way to Fisterra and the Atlantic coast. The town of Fisterra sits on the cape of Finisterre (very easy to confuse the two names!) 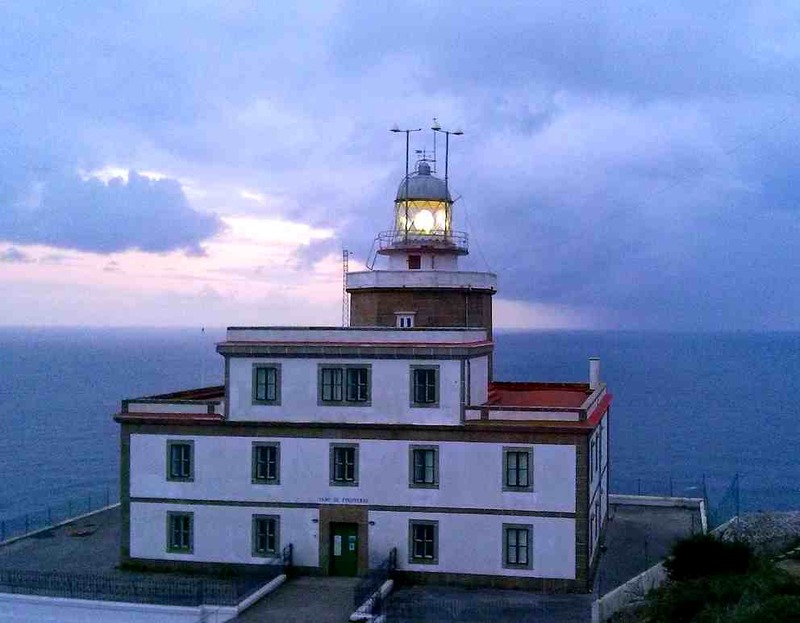 and from the town pilgrims can reach the lighthouse that marks the 0km point of the camino. From here many pilgrims choose to walk a further 29km to Muxia, another beautiful small seaside town. The path is unique amongst the camino routes in Spain as it is the only one that begins, rather than ends, in Santiago de Compostela. In fact it can almost be considered an "add on" to whatever route a pilgrim took to reach the city in the first place. After the last 100km walking into Santiago (especially on the Camino Frances) the way to Finisterre and Muxia is extremely quiet! And although it is slowly becoming more popular, only a small percentage of pilgrims who arrive in Santiago continue on this route. As the route does not cross any major cities or towns on it's way to the coast, you get to experience more of the natural beauty of this region of Spain. Beautiful rolling hills, forested areas, green farmland, stunning views of the Atlantic ocean, and sandy beaches when you arrive at the coast. 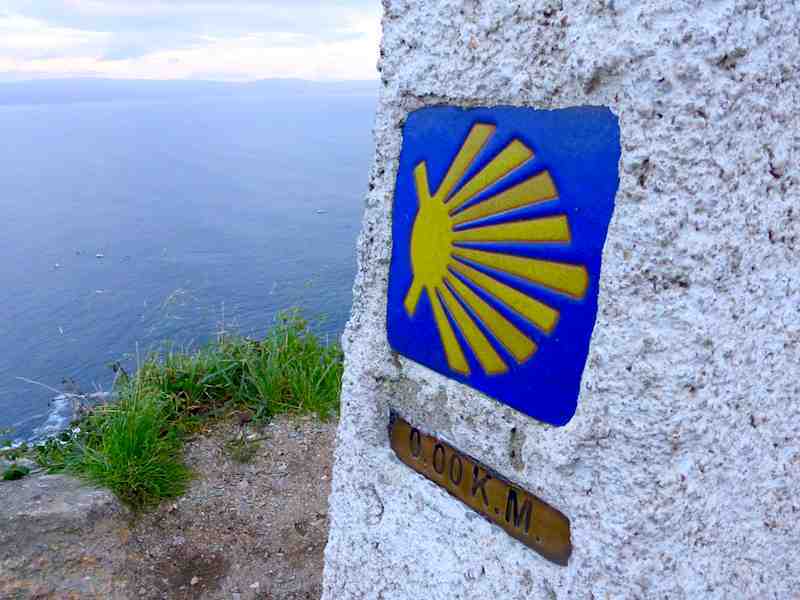 As well as the scenery and peacefulness of the route, the distance may also appeal to pilgrims with a limited time frame to walk a camino. It can comfortably be done in under a week and busses can take you back to Santiago from the coast. In Roman times the cape of Finisterre was believed to be the end of the world, it's name coming from the latin words "finis" and "terrae" (end and earth). 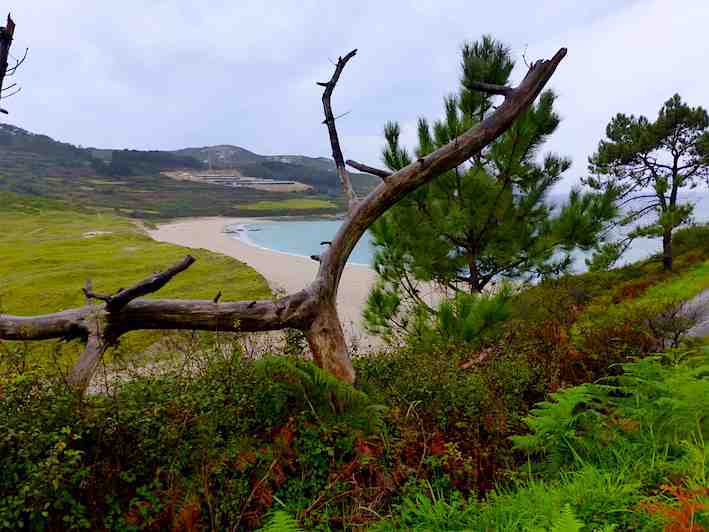 Both Finisterre and Muxia are beautiful spots to end a pilgrimage. As can be expected with a shorter and more remote path, there are not as many facilities available along the route. This is nothing to be overly concerned of though, as there are enough albergues and other places to stay and buy food from in several towns and villages along the way. The route can be walked anytime of the year, but either side of summer is usually considered the best time as the weather is more comfortable and the route is less populated. Keep in mind that, regardless of the time of year, the weather can vary dramatically from day to day here and you can expect to have at least some rain over the course of your journey, you are in the region of Galicia after all! The Finisterre and Muxia routes are generally well marked and, as previously mentioned, provide peaceful walking and beautiful scenery. But because of the relatively short distance to the coast, and fewer facilities along the way, the main issue for many pilgrims is how to break the route up into walkable stages. Pilgrims I talked to had suggested that the stages were long, more than 30km a day! That's simply not the case in most circumstances. Yes you could walk 30km or more a day and make it to Fisterre in 3 days if you choose, but you could also take 4 or more days and split the distance up into smaller segments. There is accommodation available in Negreira, Vilaserio, Santa Mariña/Maroñas, Olveiroa, Cee, Vilar, Dumbria as well as Fisterra and Muxia. So there are options! You also have the option, from a place called Hospital (an odd name if you're an english speaker!) of following the route to either Fisterre and the light house first or going to Muxia instead. From either town you can walk to the other quite easily, although the distance between the two is 29km, and then simply loop back to Santiago on foot or take a bus if you don't want to continue walking. Please see the resource section below for a free list of albergues and facilities and for further advice on how to split your walking days up. You can also find the most up to date guidebook here. • VERY IMPORTANT! If you are wanting to stay in the albergue in Muxia and are walking from Fisterre, make sure that you get a stamp (sello) from one of the bars/cafes in Lires (the town between Fisterra and Muxia) otherwise you may not be able to stay in the albergue. This applies if you are walking in the other direction as well. Basically, make sure to get a stamp everyday and definitely get one in Lires! • In Santiago de Compostela head to the Galicia Tourist Office in town where you can get a credencial (pilgrims passport) as well as a print out of all the albergues and facilities along the Finisterre and Muxia routes. A bus schedule should also be available. • Just like receiving a compostela (pilgrimage certificate) in Santiago, you can claim another certificate from the town hall in Fisterra called the Fisterrana. You must walk from Santiago de Compostela and have your credencial stamped every day along the way to get one. • A similar certificate, the Muxiana, is available for pilgrims walking to Muxia. Ask at the tourist office in town and don't forget to have your credencial stamped along the way too. • There are bars and shops in the towns dotted along the route, but it's a good idea to take some food supplies with you as well, plus enough water! • There is an option to take a small detour in Lires that leads down to the beach. There is also a cafe/bar nearby with nice views of the ocean. The detour rejoins the route further on. • Don't want to walk? Fisterra and Muxia are both beautiful towns and well worth visiting. Busses can be easily taken from Santiago and are very affordable, tours are also readily available. Please note that unless you are just doing a day trip to the coast, you will need to stay in private accommodation as the public albergues are only available to pilgrims who have arrived by foot or bike. • A great free resource! A list of all current albergues (as of June 2016) along the Camino Frances and Camino Finisterre routes. It includes contact info, website addresses, costs and facilities. Sign in to the Camino forums and download a copy here. • The Confraternity of St James offers another great free resource, a guide for the Camino Finisterre. However it appears to have been last updated in 2009 and is therefore not the most up to date guide. You can download a copy from this page. 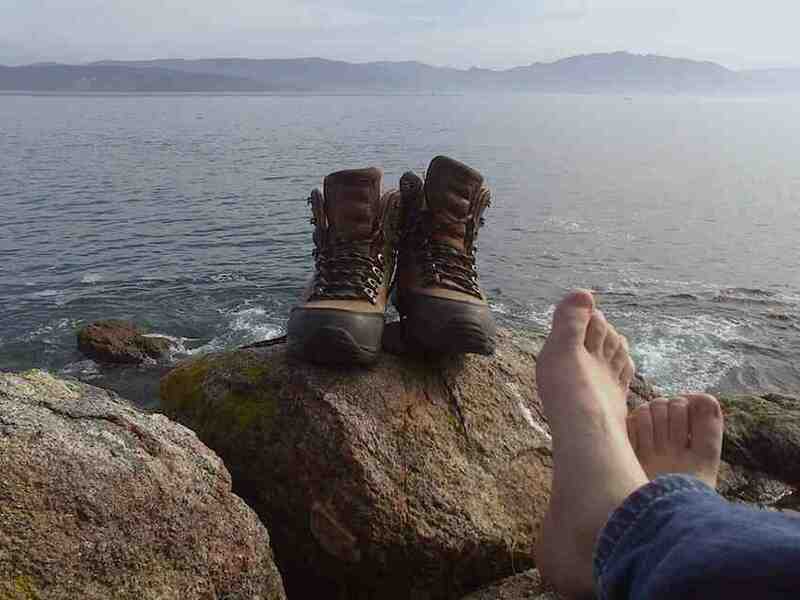 • The most up to date guidebook for the Finisterre and Muxia routes can be found here. • Eroski keeps a fairly up to date list of pilgrim accommodation as well as having interactive maps for each stage. The Finisterre and Muxia list is at the end of the page. It can be a little awkward to understand at first if you are not familiar with the Galician language but it's still a very useful resource. • For more ideas on how to split up the route into your own stages, pilgrims in the camino forum offer some great advice. This thread and this thread are good starting points and there are more to browse as well. • And finally, here are some more beautiful pictures taken of the route by Béatrice in 2013.